The University of Vienna was founded in 1365, which makes it the second-oldest German-speaking uni after Prague and the oldest one that is still German-speaking. Despite of a whole bunch of specialist subjects (such as business, veterinary sciences, medicine, arts and engineering) being excluded and tought by separate universities in Vienna, the main university has 63,000 students, making it one of the bigger ones in Europe. The old Latin name is "Alma Mater Rudolphina Vindobonensis", referring to its founder, Duke Rudolf IV and his brothers Albrecht III and Leopold III. Most of the early staff came from the Sorbonne in Paris in 1383. Only 70 years later, 6,000 students populated Vienna and made it one of the biggest academic institutions in Europe. As most of Austria turned into a rather miserable place in the course of Turkish wars and the reformation, the university was in serious trouble in the 16th century with student numbers dropping below 30 (in words: thirty). Once the counter-reformation had kicked in and the Turks were beaten and chased away beyond Hungary, Austria bloomed like never before. The university, which had been merged with a Jesuite college in 1623, boomed with the rest of the country. Empress Maria Theresia and her son and successor Emperor Joseph II were not terribly fond of Jesuites (the latter one finally dissolving the order) and cut down the religious influence of the Societa Jesu in academic matters. They also reformed the university in general and modernised it as an institution. 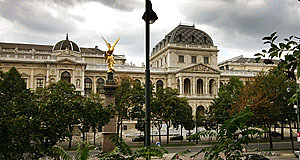 Over the course of the 19th century, the Vienna University remained under tight control of the Habsburgs. Until this stage, the history of the Viennese academic life was centred around the area of the Jesuite Church and the building of the Academy of Sciences in the first district - to me, this is the most charming area of Vienna. In the later 19th century, however, the University was desperate for more space. When Emperor Franz Joseph I started to re-vamp the Ringstraße, it was clear that a "New Universtiy" was needed. One of the most popular - and to me worst - architects of those days, Heinrich Ferstel, was responsible for the neo-Renaissance style building that was erected between the Votivkirche Church and the Rathaus, Vienna′s town hall. This building, now called "Hauptgebäude" ("main building") or, more causally "Hauptuni", was constructed between 1877 and 1884. Soon after the opening of the building, Vienna University started to spread and acquire more buildings. This trend continues until today - among the more recent acquisitions are the "Altes AKH" campus in the former general hospital and the biocenter campus in the third district. The biggest cut in its recent history was World War II and the Holocaust, in which Vienna University lost some 40 percent of its academic staff. If you walk around the cloisters of the University′s Hauptgebäude, you can see the busts of famous teachers and graduates. Here it becomes obvious how deep the gap between the glorious days before WWII and after it goes.